Reserva Conchal, located on Playa Conchal is located in the Gold Coast of Guanacaste, which is known for 300+ days of sunshine per year! This makes buying real estate in Reserva Conchal a smart choice if you are looking to invest in costa rica real estate. The climate of Play Conchal is ideal for a personal residence or a vacation rental home. 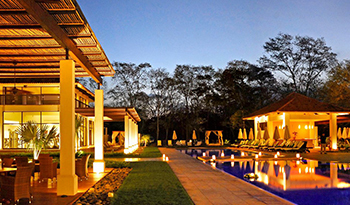 Your ROI on investment properties in Reserva Conchal will be much greater than in other regions of Costa Rica. Playa Conchal sits on the Pacific Coast of Costa Rica, along the western border of the Nicoya Peninsula. Its convenient location between the larger beach towns of Tamarindo and Playa del Coco means it's easy to get to shopping centers, restaurants, and other urban necessities. Yet those who come to Playa Conchal aren't looking for city living, big crowds, or lots of noise. This quiet and luxurious beach community is an attractive beachfront location for both families and those who are looking to retire in Costa Rica. 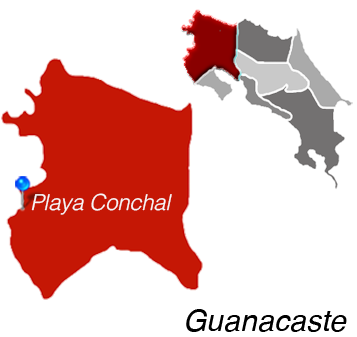 Playa Conchal can be reached by two separate entrances. One entrance is via the Westin’s prestigious Reserva Conchal. The other entrance, reserved for the more adventurous and for those who have four-wheel drive, is through the beach in nearby Brasilito. Regardless of the entrance one uses, Playa Conchal is by no means difficult to get to, yet most travelers have their eye on larger beach locations, which keeps the crowds smaller and the overall feeling much more refined. While Playa Conchal doesn’t have the crowds that exists at Playa Tamarindo, the beach is by no means deserted. Some of Guanacaste’s finest snorkeling is found at Playa Conchal, and there are small shops that rent snorkel gear for the day. There are various masseuses offering great deals on one-hour messages, and ample shopping available for souvenirs, jewelry, wood carvings, and fun beach clothes. There are even some impromptu beach restaurants/shacks offering fresh seafood and drinks to beach goers. All of these things, when combined with the beauty of this beach, make Playa Conchal one of the best beaches in Costa Rica. Finally, Liberia's Daniel Oduber International Airport is just an hour away, and Tamarindo's airport, with multiple daily flights to San Jose, is a mere 20 minutes away. Needless to say, travel is quite easy here.